For the meatballs: In a large container, mix the ground beef and pork with the egg, rice, oatmeal, tomatoes, onion, garlic, salt and oregano; season with black pepper, to taste. Form 1-1/2 inch meatballs. For the broth: Fill a pot with 8 cups of water and place on stove over high heat. Carefully add the meatballs to the pot with a handful of cilantro, serrano chile, garlic, the consommé powder and fresh oregano. To keep the meatballs in their rounded shape, be careful not to move or stir them. Bring to a boil, cooking on high. Reduce to low heat and cover; let cook for 20 minutes. Add the carrots, potatoes and zucchini. Season with salt to taste, if necessary. Cover again and let cook for an additional 15-20 minutes or until the vegetables are completely cooked. Remove from heat and let rest about 10 minutes before serving. For the garnish: Garnish with the fresh, chopped cilantro. Serve with the lemon slices, corn tortillas and the Mexican salsa of your preference. Enjoy! Add 1 can (8 oz) of tomato paste to the soup to give the broth color. 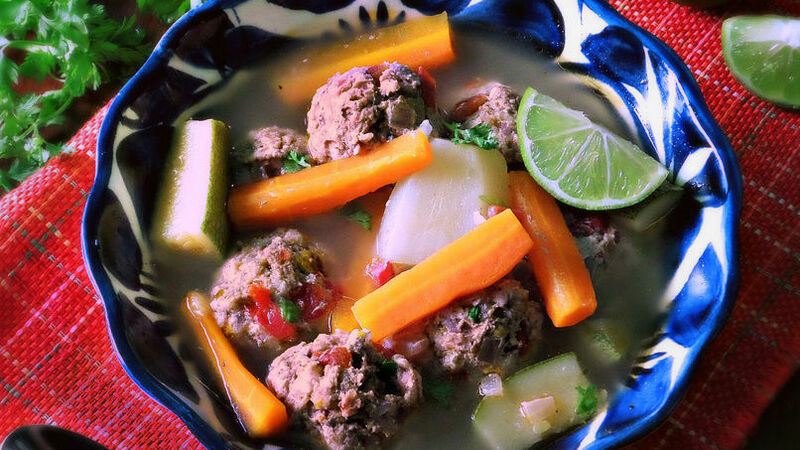 Meatball soup is one of those traditional comfort foods of Mexican cuisine. Simply tasting the broth with vegetables takes me back to my childhood and the soups that our favorite abuelita or tía would prepare growing up. As is the case with many Mexican recipes, each family has their own way of preparing it. Some add a little fresh mint to the broth or soup, while others prepare their broth without the veggies. But there’s one thing all these meatball recipes have in common: the delicious and irresistible homemade flavor!